When I was young, "chalking" of walls, gates and pavement was considered to be a heinous crime against society. There were no pressure pack cans of course, and serious graffiti was usually very serious indeed, executed with a brush and whitewash. What appears in the photograph above to be a witty piece of chalk graffiti was actually executed if that’s the right word as temporary poster art above the first level frieze of the Art Gallery of NSW. Having seen Bill Posters at work a few hours earlier, it seemed a bit lame to me that someone would draw mock graffiti on a building with chalk, no doubt while its owners looked on arms crossed an smug smiles all round, all the while donned in elaborate safety harnesses and fluorescent orange vests and under the watchful eye of a workplace health and safety inspector. I’m not sure about those orange vests either. When you are working on a ledge on the first floor of a building, what possible hazard can there be that requires you to be highly visible? 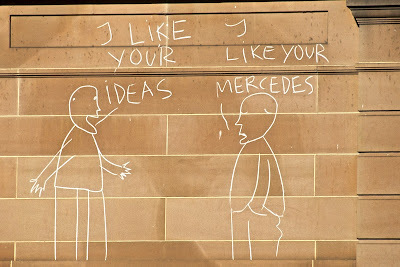 As a piece of street art, I think it's message was lost entirely, simply because by the time one has enough of a profile to draw on a gallery wall under supervision, one probably already owns a Mercedes. It succeeded in one sense though as it reminded me of another angry message I once read. This one was in the mid seventies, and while spray cans were available, they were clearly too expensive to use in this manner, as the writing was in a heavy brown brush. It was on a retaining wall at Bondi Beach, where the water was often fouled by a sewerage outfall which deposited its cargo in exactly the wrong part of the current in prevailing breezes, and was the subject of much public angst. Are you really going to swim here? ... or just go through the motions. bitingmidge.blogspot.com is very informative. The article is very professionally written. I enjoy reading bitingmidge.blogspot.com every day.